Unused text that is much more plain than what gets used. My palette is wrong and I don't know what the correct one is, but I'm guessing it'd be white. 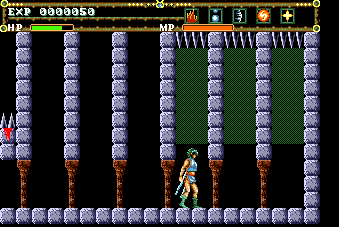 These building sprites are loaded when the fourth level starts, but are never seen during gameplay. 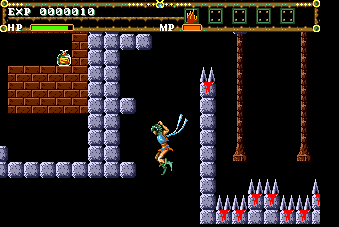 An early screenshot of this level shown in the August 1991 issue of Beep! 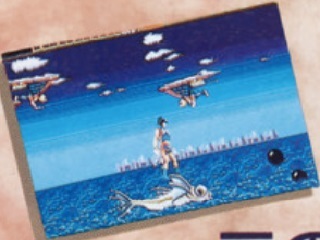 Mega Drive does feature a screenshot showing what look like these sprites in the background, but they ended up being removed for the final game. What appear to be even smaller building sprites. Like the ones above, these are loaded during level four's opening, but are never used anywhere. A couple of sprites loaded during the final boss battle, but aren't used for anything. These look like they could have gone on the larger pillars seem in the room. Some more sprites that are loaded during the final boss, but don't get used. I'm not sure what these were meant to be for. Early floor sprites, perhaps? The first track is number 8 in the sound test, the second track is number 21. I've got no idea where the first track could have been used in the game. My theory for the second track is that it was meant to be played for when Annet obtains a new magic spell. Found by Ragey, the text below is for the game's intro. Strangely this English text is only in the Japanese version. It features several typos that I've left unchanged below, and the intro text for the English version of the game would be re-written. Even stranger is that a prototype version of the game, seen as the 1991 Tokyo Toy Show, featured this early text in it -even though it was on display at a Japanese show. "Tornado" is approaching........ With its huge funnel upright, in order to create a dreadful world. The powerful tornado "El Viento" has just started it's activities. In 1928, in New York, the sky scrapers are about to be overwhelmed by the force of an evil, dark world power. The fanatic believers who worship the devilish lord from the outer world, Hastur, are planning a ceremony summoning their lord. The founder of the religion, Henry, is plotting the destruction of mankind by summoning of Hastur. Restiana, a young woman who was given power by Hastur. Vincente DeMarco, kingpin of the Mafia group, pulls strings in a conspiracy with the religious group for the summoning of Hastur. An evil lord is descending on the Empire State Building, a towering structure, the landmark in New York. A young girl comes to smash their terrible ambition. Annet is destined to confront the religious group despite her accursed blood relation with Hastur. Why are you making trouble for us, Annette? "Why do you stand in our way, Annet?" "Aren't we of the same blood as Lord Hastur? You are supposed to be on our side." I`m a human being just like you! "Because you and I are human beings." The life and death struggle has begun! Fierce battles have just begun in this evil-infested New York. 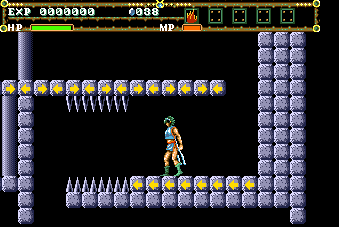 An unused test level, which is extremely hard and features several sprites not seen anywhere in the game itself. As the test level is so large I've done a separate page about it here.